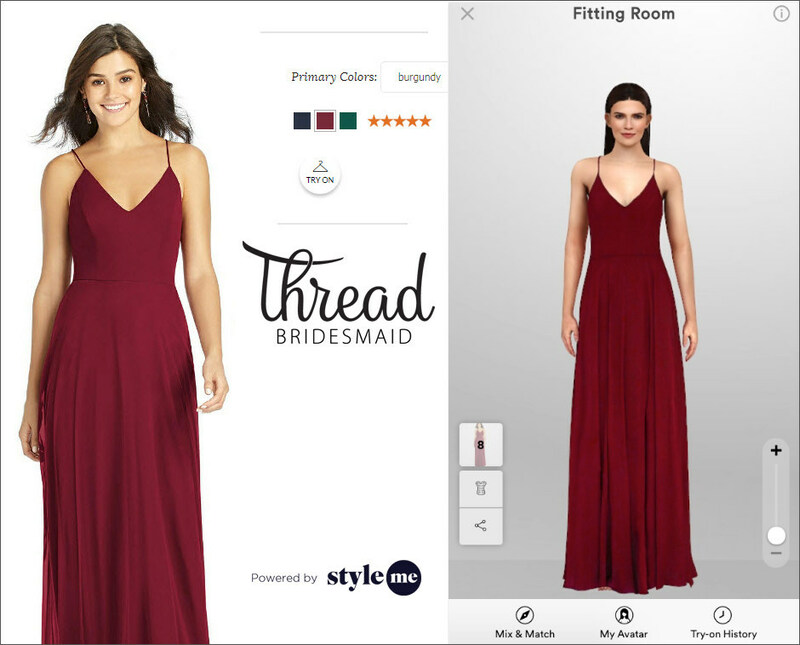 A new collection of ready to ship bridesmaid dresses under $150, plus a virtual fitting room. FOR IMMEDIATE RELEASE – 11 December 2018, New York, NY Dessy Group has launched a new collection of bridesmaid and social occasion dresses under the label Thread Bridesmaids. The collection will feature a range of simple silhouettes by Designer Vivian Dessy Diamond, with prices ranging from $119 to $149. Thread styles will be offered exclusively on Dessy's website Dessy.com with all styles available for quick delivery. Dessy has also partnered with fashion fit technology, Style.me to provide a virtual "try-on" capability. Each user can create a personalized avatar image based on her body measurements, skin color, and hair color. She can then try on any Thread style to gain the most accurate fit as well as see a 360 view of her selections. Other features include, heat fit mapping and social sharing. "We're delighted to be launching Thread Bridesmaids at a time when brides are looking for an affordable collection from a trusted source. Dessy Group has been dressing bridal parties for 80 years and we continue to evolve to serve their needs," says Alan Dessy, CEO of the Dessy Group. "We're also excited to work with Style.me. Their fashion technology and fit service will make our customers even more confident in their shopping experience." The Dessy Group is a leading social occasion and bridesmaid dress manufacturer and retailer based in New York. In addition to Thread Bridesmaids, their collections include: Dessy Collection, After Six, Alfred Sung, Jenny Packham, Social Bridesmaids and Studio Design. Founded in 1939 by Margot Rosenthal, A & M Rosenthal, now The Dessy Group, got its start designing bridal veils and attendants' headpieces. In the 1950s, Margot's daughter Ronnie and her husband Andrew Dessy took over the business and added bridesmaid dresses. Today, The Dessy Group continues to thrive under the leadership of Alan Dessy and design direction of Vivian Dessy Diamond who are the third generation in the business. dessy.com. Style.me is a revolutionary virtual styling solution for fashion brands to provide online shoppers with a personalized and social shopping experience. A powerful plugin for any e-commerce platform, it integrates a 3D virtual fitting room to any online retail website, solving the biggest pain points that online apparel retailers are facing: low conversions and high return rates. Style.me was founded in 2015 with the aim of transforming the fashion ecommerce experience and has developed proprietary technology in 3D scanning, patented 3D geometric deform, simulation and layering technology.